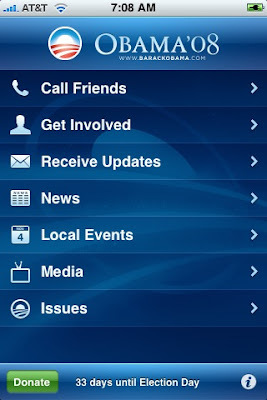 Sen. Barack Obama's presidential campaign launched an iPhone application on Thursday that turns the vaunted device into a political recruiting tool. The most notable feature "organizes and prioritizes your contacts by key battleground states, making it easy to reach out and make an impact quickly," according to the software. On my phone, the application ranked contacts in Colorado, Michigan, and New Mexico at the top; at the bottom was a friend whose cell phone has a Texas number, though she actually lives in California.